This drill originated from the commonly cited statistic that the average gunfight is 3 shots, in 3 seconds, at 3 yards. Each string has a par time of 3 seconds. The skills tested on each string correspond to the tasks a skilled, trained shooter should be able to perform in 3 seconds or less, at 3 yards and 7 yards. Use of a single par time for all strings makes this drill quick and easy to run. The current version of the test is shot using the KRT-2 target, which is printed on 11"x17" paper. Download this image and print your own. This drill is roughly twice as hard as the Texas LTC shooting test, and requires shooting with about 50% of the speed and accuracy of an IPSC Grand Master. Anyone in "C" class in IPSC, or Sharpshooter in IDPA, should be able to shoot a 100% of the points on this drill. It's not intended to challenge advanced level shooters. It's intended to define a baseline minimum competency level every person that carries concealed should be able to achieve. DPS-1: Count hits. Need 14 or more hits in the A/C zone ("0" and "-1", head and center body) to pass. 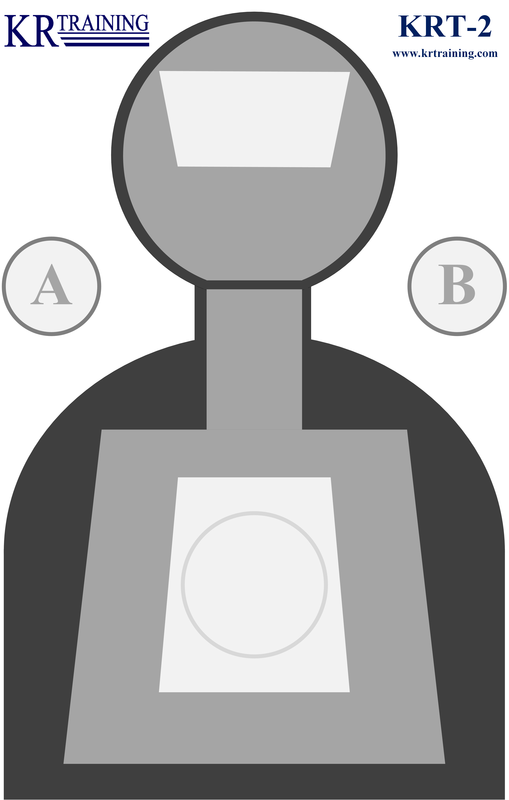 DPS-2 & DPS-3 scoring: A Zone ("0" 8" IDPA circle) and head are 5 points. Outside the circle but on the brown overlay (C Zone/ "-1") are 3 points. Zero points for D zone/"-3" hits or misses. Should have 17 hits in body, 3 hits in head. DPS-2 passing score: 80 points or better, must have at least one hit in head to pass. DPS-3 passing score: 90 points or better, must have at least 2 hits in head to pass. When the start position is “ready”, you can use either a low ready (gun drawn, gripped in both hands, arms fully extended, gun aimed below target) or a compressed ready (gun drawn, gripped in both hands, arms pulled close to chest with muzzle level with target). When running this drill with a pocket gun, start the "hands at sides" strings with "hand in pocket, gripping gun." Here are MP3 and WAV audio files for "shooter ready....standby...beep (3 sec pause) beep" that can be used for dry fire or live fire practice on this drill. Here's a printable PDF version of the test and the target. Hands at sides, gun concealed. Step left, draw and fire 3 body shots, 2 handed. Firing hand on gun, support hand on chest. Draw and fire 2 head shots, 2 handed. Step right, draw and fire 3 body shots, 2 handed. Take one step forward (2 yards), firing hand on gun, support hand on chest. Draw and fire 2 body shots, firing hand only, while backing up. Start with magazine in support hand, slide-locked gun in firing hand. Magazine 1”-2” from mag well, ready to insert to complete the load. On signal, insert mag, rack slide, fire 1 body shot, 2 handed. (after) Return to ready position. Fire 2 head shots, 2 handed. Fire 2 body shots, firing hand only. Face 90º to the left (LH shooters, face right), hand on gun. Turn, draw and fire 3 body shots, 2 handed. (after) Transfer gun to support hand. Firing hand on chest, gun in support hand, aimed at target, finger OFF trigger. Fire 2 body shots, support hand only. (after) Transfer gun to firing hand, unload/reload and holster. I've updated this drill a couple of times since the original version was published in Concealed Carry magazine. Changes were made to add a few more skills (reload/gun manipulation, turning draw, rearward movement), to balance out the difficulty of each string, and to re-organize the drill to make it friendlier to run for guns holding 5-9 rounds. More detail has been added to explain what to do before/after each string to aid in giving range commands. One way to use this drill in training is to adjust the par times. If you can't shoot 100 points using a 3 second par time, try a 3.5 second or 4 second par time, and work on accuracy until you can shoot 100 points. Then decrease the par time and work on speed. If you can shoot it clean using 3 second par times, try it with 2.75, 2.5, 2.25 or even 2.0 second pars. If you find yourself dropping points on one particular string, work on that (dry and live fire) until that string is mastered.